Your average infrared thermometer uses only a single laser point to help you determine where it is measuring heat from, but it doesn’t take into account the bigger field of view the thermometer is measuring at longer distances. The new Circular Laser Infrared Thermometers from Thermoworks use a total of 8 laser points to give you a better representation of the area you are actually measuring, even as distances change. 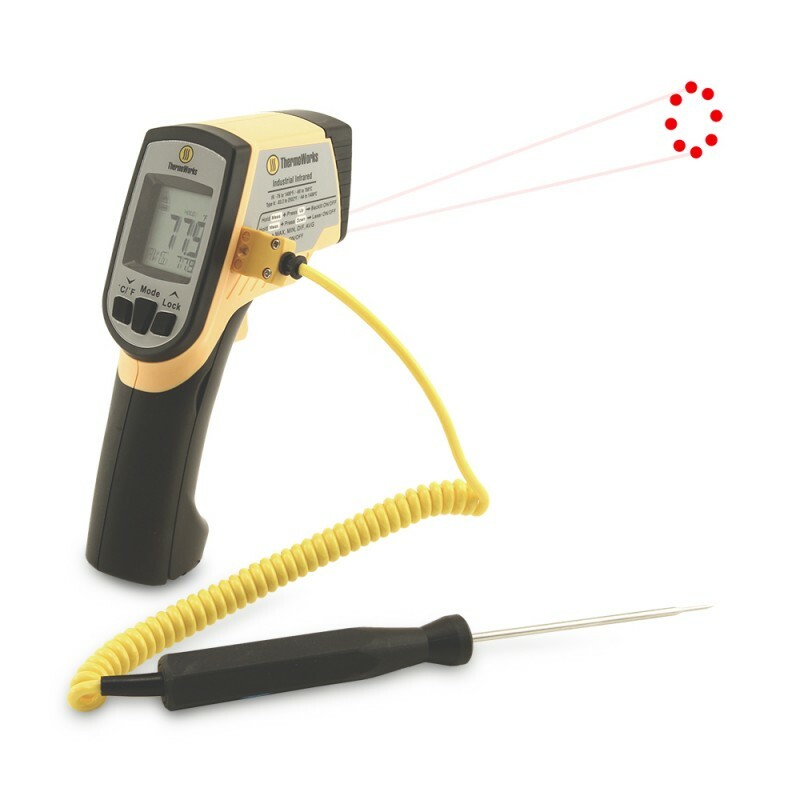 It is a common misconception that the laser dot on infrared (ir) thermometers is what is being used to measure the temperature; the truth is that it is only there to help the user target the location. So the temp measuring of an ir thermometer is not laser accurate, the field of view actually gets wider at greater distances and the thermometer will average the results to give you the final reading. Unless you know your ir thermometer’s distance-to-spot (ds) ratio and the distance to the target, it can be hard to know what exactly is being measured. Thermoworks’ Circular Laser IR Thermometer uses its 8 laser dots to give users a better visual approximation of the area that is being measured and averaged, which should lead to more accurate results. Two models are available, model IRK-2 with a -58 to 1022°F temperature range and a 12:1 ds ratio, and model IR-IND with a -76 to 1400°F temp range and a more accurate 30:1 ds ratio, which are priced at $89 and $149 respectively. Both models can also accept secondary Type-K Thermocouple probes from Thermoworks, and they have a large selection to match the needs of various trades.